My People and my future self. I apologize to you now. You know that I never measure things. You know that I just like to taste things and grab handfuls of ingredients and toss them in. This recipe isn't going to make much sense and we are all going to be sad that I didn't take measurements. I promise you that this was SO DANG GOOD! First I had a pork tenderloin, it was a big one, I don't know how big because Brian bought it. Then I preheated the oven to 450 degrees with my cast iron skillet inside it. Then I took some coarse salt, freshly ground pepper and roughly equal amounts of cinnamon cumin, chili powder, and smoked paprika and mixed them together, then I coated the tenderloin in the spice mixture. When the oven was hot I took out the skillet and poured some oil in it about enough to cover the bottom of the pan well but not too thick. I used canola because I was worried about the smoking point but now I think that olive oil would have been fine. Then I put the tenderloin in the skillet, my tenderloin was huge and my skillet just regular so it curled up in the pan. Then I put it in the 450 degree oven for 10 minutes, after 10 Minutes I turned it over and cooked it for 10 minutes on the other side. Pork needs to be cooked to about 140-145 degrees and mine wasn't quite that hot in the thickest part of the meat so I let it cook until it reached 140 degrees (2-3 minutes?) and then took the pan out of the oven, moved the tenderloin to a plate and covered it with foil and let it rest for 10 minutes. While the meat was resting, I had Margaret mash the potatoes while I took the cast iron skillet and poured in some cream - this is where things get dicey. We had a not quite full pint of cream when we started but we used some in the mashed potatoes...I am going to guess 1/2 pint of heavy whipping cream (or 1 cup) was then poured into the hot skillet with all the pork drippings, I turned the heat of my brand spanking new gas range to med-low and began to heat up the cream. 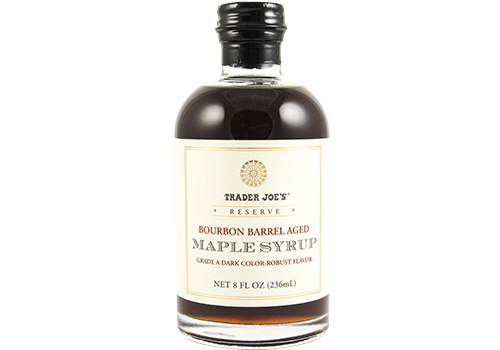 I added some Burbon Barrel Aged Maple Syrup from Trader Joes - again I just poured some in there, maybe 1/4 cup maybe less? And I added some coarse salt. It was too sweet so I added a bit more cream and some more salt. I cooked the sauce until it was bubbly and had begun to thicken and then I added about 1/2 cup fresh parmesan cheese, grated. Please use a real block of parmesan, not the powdery stuff that comes in a green tube. Stir it in until melted. Then we ate. If your family isn't comprised of barbarians you can go ahead and pour the delicious sauce of wonderful delight over the sliced tenderloin. If it is, serve it on the side. It also made a great gravy for the mashed potatoes.